MagazinePAPA: Lavender Colot (pastel tone) nail recommendation! This is my own color that my friend doesn't know! This spring, pastel tone, beige cream tone are the most promising starts among all colors. Khaki or black never had chance to be a fashion. There must be someone who picks up 'bring' pink in triteness of pastel. Pink is not the one this year. But I decided to wear orange this spring all fall, what ever they say. I've never thought of color in vague because I find colors that match me. I mentioned vague after being surprised by who I serve these days. The client is none other than my sister. She is the one who studied without knowing how take care of the way she looks. But now she takes advantage from me with make-ups. She seems to be the best beneficiary but she doesn't trust me. Whenever my sister's friend check my blog, they nitpicks her for not telling them about the cosmetics. But my brother didn't know about them actually. And then she nitpicks me for not giving those information. It's sum of what I collected for many years, but my sister doesn't listen carefully. Hey, she actually doesn't know about them. She didn't hide them to you. She never listens to me at home. She is the one who cleanse with tissue after applying cleansing oil. Like this she has 'unique' beauty methods. She only listen s to doctors or her credible friends, not us. So don't ask her about me. Don't say anything about my sister on my blog to her. My sister doesn't goes to a nail shop. She is a real miser. So I sometimes Myself gives her a nail care. This makes me dignified to my sister. During care, she serves me like a king. She is the only one who has a frog-like nail in my family. But the nail got better after my sincere care. In fact, I didn't get instructed about nail professionally, so I don't have any idea how her nail improved so much. One day, she said something weird. She Threw a pen and said "I want my nail colored just like this color." "How dare she command to me?" But...I took the pen and looked for a manicure in that color. Not in department sore....I didn't check the online market because I can't actually test it thought internet. There was no real lavender thought it had violet and pastel purple in my shop. It had to be weak purple but clearer than pastel tone. I even went through road shops, and finally I got it at Nature Republic. 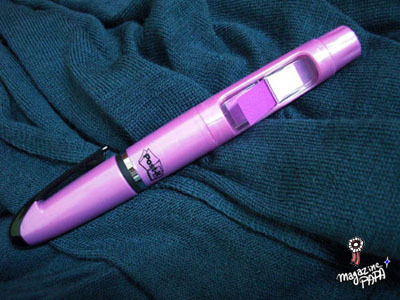 In fact, it’s not 100% coincidence with the pen my sister gave. About 92%? Anyway, I purchased it so happily. I ran to my home to share this delight. She liked it very much. 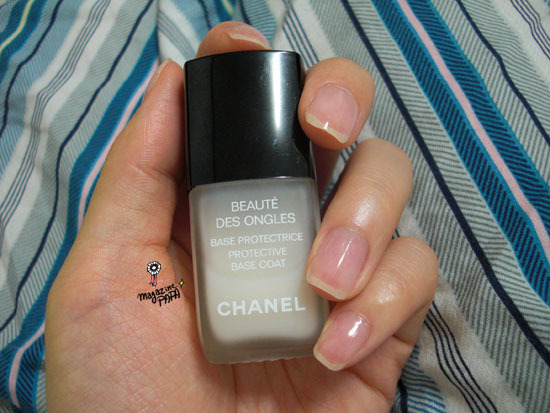 Before coloring, I like to introduce Chanel Base Coat which I showed at my blog. The nail may seem original, but it has healthy shine with little milk color. I won’t go further as I talked about I before. Dry fast on nail, but not in the bottle....I'm determined to use it up totally. I tried it on my nail. I’m sometimes jealous of people with frog-like nail, because it looks cute. Please check the color at offline market because there can be color difference according to monitor. It goes well with all the skin unlike pastel-toned purple which is popular in summer and fall. The color is attractive so it goes well with yellow or black hands. Also, it doesn’t look childish. It gives cute feeling with short nail, and delicate feeling to slim nail. It’s not like original pastel color. By the formula of ‘men like pink but not wine color’, lavender has advantage of both colors. But who can apply it all over the body? But story changes when it comes to nail. You can experience without worry. It makes nail coloring attractive. The picture was taken after painting once. The coloring is so great that you don’t need to paint it twice. In case you don’t have a base coat, painting twice is necessary. I suggest you to use base coat. It’s useful for successful coloring. Like you can see on the picture, minute pearl glitters. My sister didn’t like the pearl for the first time, but she came to like it after experiencing it. Seen from far distance, it only look shiny without pearl. I don’t think top coat is an essential one. Oh, it means it might be good if you mix it with pink tone, which you might have one at home. I think I had something to say but I forgot…. Enough sleep is necessary for brain works. This is one of the biggest mistakes ever. I should take enough sleep now on. The brush above is wide brush. It’s double the regular ones. So you cant paint very fast and easy. Wide brushes are getting popular these days. Wide brush is good for people with big hands. Oh, and this brush has advantage of fast dry.